Directed by Carl Overly, Jr. The latest production from R-S Theatrics has an eye-catching title, but there’s a lot more to it than that. The Motherf**ker with the Hat is technically a comedy, but there’s a degree of sadness, and even tragedy there as well. It’s a character study, looking at complex people and situations, and R-S has assembled a strong local cast for this memorable St. Louis premiere. The story is intense and challenging, but with a lot of comic dialogue and surprising situations, as well as richly defined characters. Jackie (Adam Flores) has recently been released from prison after serving time on drug charges, and he’s trying to get his life back together, staying sober with the help of a 12-step group. He’s just gotten a new job, and he’s hoping to celebrate with his girlfriend, Veronica (Sofia Lidia), but soon he discovers a hat in her apartment that doesn’t belong to him, making Jackie suspicious that Veronica may be cheating on him. He takes refuge at the house of his sponsor, Ralph D (Aaron Dodd) and his wife Victoria (Talessa Caturah), who are now in the “nutritional beverage” business. He also enlists the help of his reluctant Cousin Julio (Jesse Muñoz) in one of his schemes to deal with the hat situation. That’s about all I can say in terms of plot without spoiling too much, because this story definitely has its twists. Just know that things aren’t always as they seem, and Jackie learns that some people are not as trustworthy as they seem, while others might have more complex motives. Essentially, it’s a character study, also taking a look at the challenges facing someone in Jackie’s situation, as well as Veronica’s, and how easy it is for some people to take advantage of people in vulnerable situations. It’s a gritty, intense play highlighted by sharp dialogue, strong language, and raw interpersonal interactions. The characters here are multi-faceted, as are the impressive performances from the cast. As Jackie, Flores manages to be likable, intense, impulsive, and vulnerable at the same time,. Dodd as the self-centred, bold-talking Ralph is also excellent, portraying a character who is more than he may initially seem. Lidia, as the conflicted, addicted Veronica, gives a convincing portrayal of a woman who’s caught in several difficult situations. Caturah, as the exasperated Victoria, is also impressive, as is Muñoz as probably the kindest character in the show, the questioning but supportive Cousin Julio. The character interactions are highly charged much of the time, and they are well portrayed here by the cast and through director Carl Overly, Jr.’s fast-paced staging. The .Zack can be a difficult performance venue, with its high stage, odd sight lines and giant pillars, but this production uses the space well, opening up the staging so the performance space includes the area in front of the stage in addition to the stage itself. Taylor Gruenloh’s set design reflects the grittiness of the piece, with its effective representations of Veronica’s small apartment the versatile floor area that converts from Ralph’s place to Cousin Julio’s place with a few quick furniture changes. The costumes by Christina Rios suit the characters well, and there’s also evocative use of lighting by Todd Schaefer and impressive sound work from Mark Kelley. R-S Theatrics is known for its memorable, challenging, St. Louis premiere productions, and its latest show is another example of this tradition. The Motherf**ker with the Hat is a crass, sharply characterized, sometimes brutally intense show that portrays its characters with their flaws on clear display. The characters aren’t always easy to like, but they’re always interesting. It may seem a little too bleak for some, especially for a comedy, but at R-S, it’s especially well staged, and it’s worth checking out. Slightly Askew Theatre Ensemble (SATE) is closing out its year-long “Season of the Monster” with a brand new show that revolves, partly, around one of the most iconic monster stories ever. Mary Shelley Monster Show even opens with a montage of projections of various versions of the infamous monster that’s at the heart of Shelley’s most famous work, Frankenstein. This story, though, is about much more than Frankenstein. 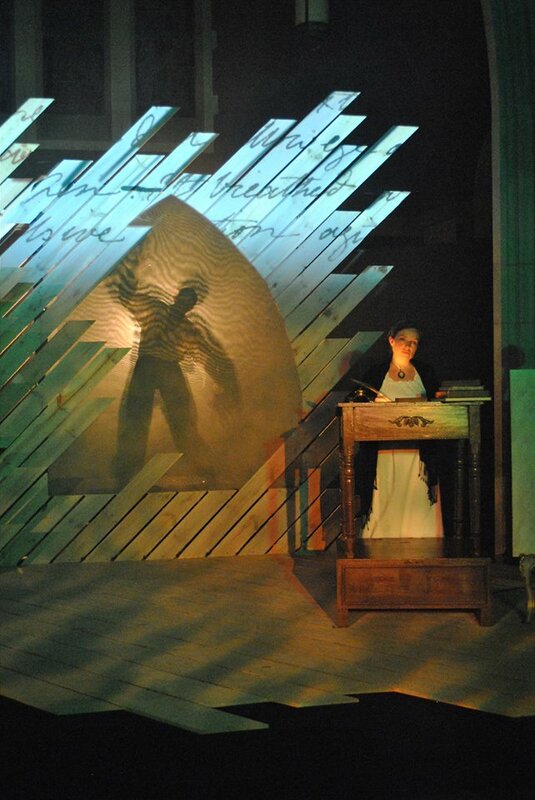 In this innovative, technically stunning production, SATE brings Mary Shelley and her world to life in an entertaining and thoroughly riveting manner. The play is short but extremely contemplative, and it’s never boring. As Mary (Rachel Tibbetts) poses for her most well-known portrait by painter Richard Rothwell (the offstage voice of Carl Overly, Jr.), she recalls the important moments of her life and the people-both real and imaginary–that inhabited it. These characters, from the monster himself to such real-life figures as Mary’s poet husband Percy Bysshe Shelley, her mother Mary Wollstonecraft, her father William Godwin, the illustrious poet Lord Byron and others, are all played by Ellie Schwetye. Through Mary’s recollections, reenactments, and an abundance of projections, we are given a glimpse into Mary’s mind as she recalls historic moments in her life, and her various relationships with those who have been most important to her. We also see her relationship with her work, represented by her various philosophical discussions with the shadowy figure of the monster, who gradually evolves throughout the course of the show and challenges Mary to think about her relationship, as a writer, with her creation. It’s an exploration of one woman’s life and also the lives of famous literary figures and of one work in particular and how that work has survived its creator and even eclipsed her in notoriety, reflected in the play as Mary tells the monster–who questions his reality–that a creation often becomes more “real” than its creator. What’s real here is the sheer wonder of this production, both technically and in its performances. Tibbetts gives a reflective, confident performance as Mary, portraying her various stages of life and conflicting emotions with veracity and depth. From her regrets over the deaths of loved ones, to her deep love and near-worship of her dynamic husband, to her verbal sparring with the charismatic Byron, Tibbetts is thoroughly affecting. Schwetye also impresses in at least nine different roles, portraying this wide range of characters clearly with, for the most part, only minimal changes in costume. She is particularly effective as the self-confident Byron, as the reassuring ghostly figure of Mary’s late mother, as Mary’s emotional step-sister “Claire”, and especially as the increasingly confrontational monster. Schwetye makes the transitions between the various characters seem effortless, and the chemistry between her (in her various incarnations) and Tibbetts is excellent. Lending support to these two dynamic actresses is Overly, who never actually appears onstage but manages to make an impression with his voice, as the painter who serves as something of a catalyst and sounding board for Mary’s reflections. Technically, this show is nothing short of marvelous. With a striking set by David Blake, along with Bess Moynihan’s atmospheric lighting, Michael B. Perkins’s abundant and colorful projections, Elizabeth Henning’s costumes and Schwetye’s sound design, this production strikes and maintains just the right mood. It’s haunting, reflective and educational all at the same time. 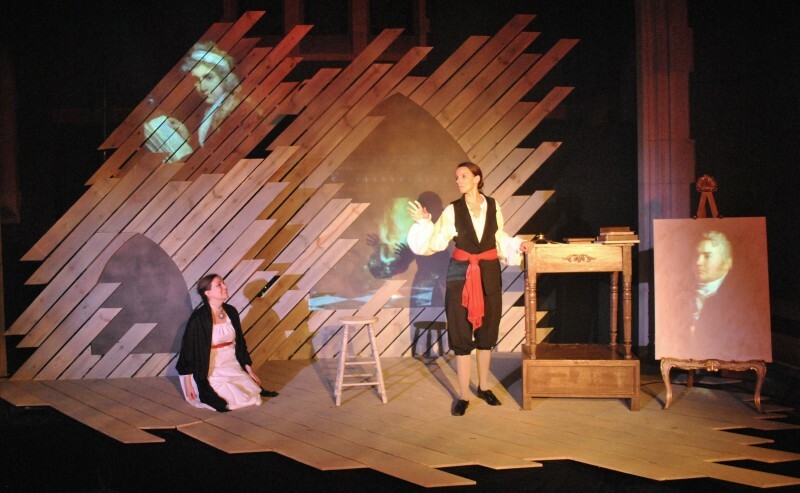 This team has managed to use the somewhat limited space in the small Chapel venue to its best advantage, taking the audience on a trip into Mary Shelley’s world and into her very thoughts. This is great example of a show in which the technical elements add to the drama of the production rather than dominating or distracting from it. It’s a highly commendable effort from all involved. This is a unique and fascinating play that educates as it entertains, as well as providing a basis for thoughtful discussions on the nature of writing and of an artist’s relationship to her craft. It’s another triumph for the collective creative talents of SATE. Over the past few years, this small, unpretentious theatre company has consistently turned out some of the most exciting,intriguing productions in St. Louis. I’m constantly impressed at how much the team at SATE continues to grow and stretch their limits as a company, continually trying to challenge expectations and then rising to the challenge. It’s companies like this that help make the St. Louis theatre scene great. Mary Shelley Monster Show is the latest, and quite possibly the greatest, of SATE’s many successes. I look forward to seeing what their next season brings.